If you weren't able to see the 2015 CMA Music Festival in person, don't fret. ABC knows not everyone has the time, money, energy, or tolerance for port-a-potties to spend a few days in the great outdoors listening to country music. That's why the network will be airing a special broadcast of part of this year's CMA Music Festival Tuesday night. But, in order to be able to pretend like you're so close to Luke Bryan you can almost touch him as you're watching Country's Night to Rock, you should know exactly when and where the CMA Music Festival was recorded this year, you know, to get the full effect and all. The 2015 CMA Music Festival was a four-day event that took place from June 11 to June 14 in Nashville, Tennessee. Over 500 artists provided more than 250 hours of entertainment during the festival, performing on 11 stages. The main one was at LP Field, which was recently renamed Nissan Stadium and is where the NFL team the Tennessee Titans plays. That's also where the likes of Brad Paisley, Carrie Underwood, and Keith Urban performed, which means that's probably where most of the ABC special will take place, since this is where the big names were at during the festival. The other 10 stages were not far, scattered around downtown Nashville. With all of that country music packed into four days, ABC is sure to show you the highlights. However, you're bound to miss something because, hello, did I mention there was more than 250 hours of performances at this thing? If ABC showed the whole shebang, your life would become totally consumed by country music, which may not sound like such a bad thing at first, but it unfortunately doesn't pay the bills or help you maintain friendships. A much better idea would be to plan to watch the CMA Music Festival special on ABC, and, in the meantime, take a look at some of what may not make it to TV below. OK, so you may get a sense of the ginormous turnout at the 2015 CMA Music Festival by watching the special on ABC. However, knowing the actual number of people that attended may knock your cowgirl boots off. The 2015 CMA Music Festival had a daily attendance of 87,680 fans, up 9.6 percent from the previous year and setting a record in the process, according to a CMA release. Your move, 2016 festivalgoers. Luke Bryan is one of the hottest country stars around today, but that's not why he was so steamy during a Friday night performance at this year's CMA Music Festival. As Rolling Stone pointed out, Bryan was accidentally on top of a smoke machine when it went off and suddenly covered him in fog. Ever the pro, Bryan just laughed off the funny accident and went on with the show. As the CMA Music Festival took over Nashville in June, GLAAD organized the first-ever Concert for Love and Acceptance to support the LGBT community. The concert featured country singer Ty Herndon, who came out as gay in a November 2014 People Magazine interview; radio host and author Meghan McCain; and actor Chris Carmack, who plays gay country singer Will Lexington on Nashville. The fact that this concert took place is one huge step in the right direction towards acceptance for all. If there was an award for cutest country music star you just want to pick up and put in your pocket, Kellie Pickler would win it for me every time. However, the award that she was unexpectedly presented with during her performance at the CMA Music Festival this year was more important. The parents of Chris Kyle, the subject of Clint Eastwood's controversial 2014 biopic American Sniper, presented Pickler with the 2015 Operation Troop Aid Chris Kyle Patriot Award for performing for the troops in the U.S. and overseas on several occasions as part of USO tours. Now that deserves a standing O. The Oak Ridge Boys are a legendary country music quartet, and one of the group's most famous singles is "Elvira." If you've never heard this song before, you need to watch this old-school performance of it ASAP just for the facial hair and the "ba-oom-papa-oom-papa-mow-mow" alone. The Oak Ridge Boys invited Little Big Town, who will be hosting the CMA Music Festival special on ABC Tuesday night, onstage to help them sing the group's classic song. The two groups combined and slowed the song down to give it more of a bluesy feel, putting a fresh and memorable spin on the well-known tune. OK, so Carrie Underwood is slated to be featured during ABC's special, but you can never get enough of one of the biggest stars in country music today, and who knows how much of her performance will be shown? 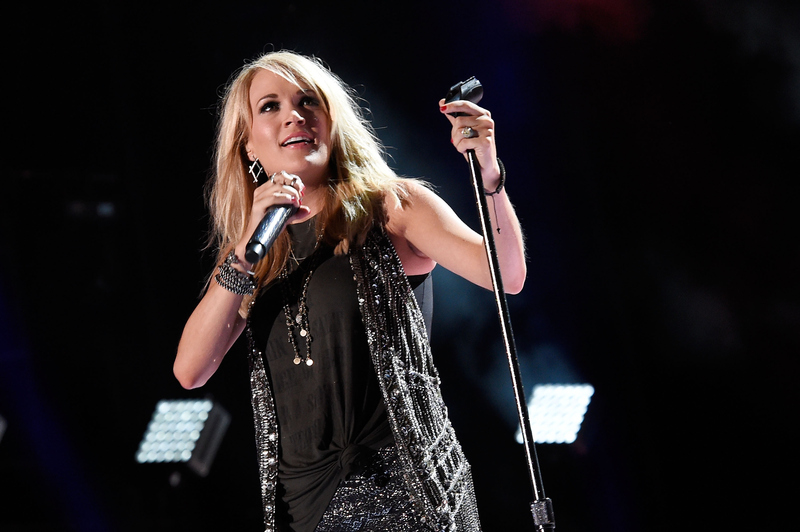 Underwood looked fierce and sounded even fiercer during her CMA Music Festival performance, especially during her belting rendition of "Little Toy Guns." Now, don't you feel like you were actually there?